Several of our members ride Audax. These rides are arranged informally via our Facebook page and / or the calendar app which is made available on joining us. 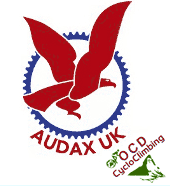 Audax is a cycling sport whereby the entrants cycle long distances within a set time. They are not races & the time limits are quite relaxed on shorter versions. Audax generally follows the following distances : 100km/200km/300km/400km & 600km, there are longer events like Paris-Brest-Paris (1200km in 90hrs) & London-Edinburgh-London (1400km in 116hrs).Routes are created for cyclists by experienced cyclists and tend to follow quiet scenic country roads. 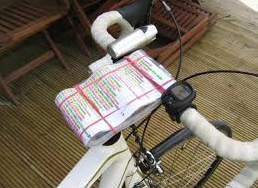 The main theme of Audax is self-sufficiency, you are given a route map and a GPX file which you follow. Each rider carries a ‘brevet card’ which is stamped at intermediate checkpoints and at the finish, and which is later returned to the rider as a certificate of their achievement. On return to the HQ the rider hands the Brevet card to the oragniser who ratifies your progress. You do not have to be a member of Audax UK but you will pay an on-the-day insurance of £2 if you are not, even so Audax is very cheap with 100-200Km events typically £5 or £6. AA Points : Altitude award points. Next to many Audax events there may be a reference e.g. AA1.75, this means you will climb at least 1750m during this ride. A lot of Audax rides are hilly & there are AAA points & awards for seaking out the hilly rides. GPX : Files of the route supplied to put into your Garmin et Al for following the route electronically. Route/Cue sheet : A written instruction of the route which also contains information of café stops/information controls. These are always in Km. And generally secured on a bar bag or handlebars. Perms : Along with calendar events you can also ride the ‘Permanent’ version. These can be cycled any date you want except for on the calendar date. Perms are usually only £2 and can be bought from the organiser. Audax is one of the most social ways of riding and the event generally finishes with a pile of cake. We are very lucky to live very close to some of the best Audax routes in the country, in fact one organiser is a Stockport Tri club member.